Hey guys this is Kevin from Jaztime.com. 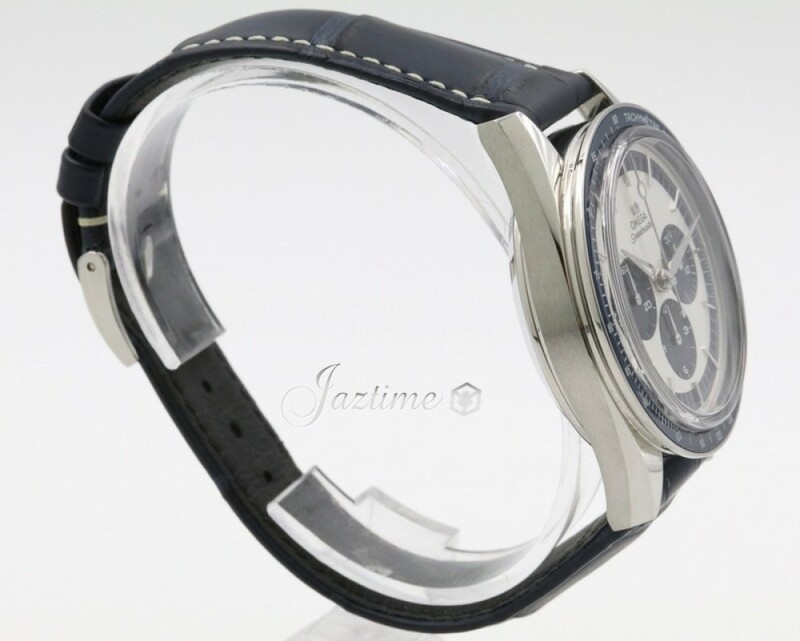 Jaztime.com is an online store that buys sells, trades authentic luxury watches. We make this video so our customers can easily choose the best watch for themselves in the comfort of their own home. 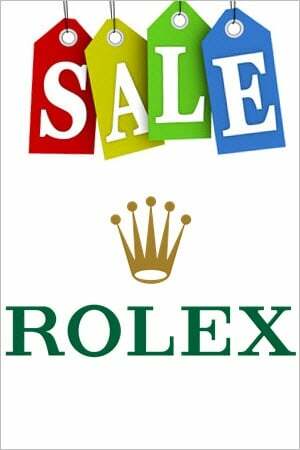 We offer the lowest prices anywhere online and if you would like to know the price of the watch, simply click on the links in the description below. 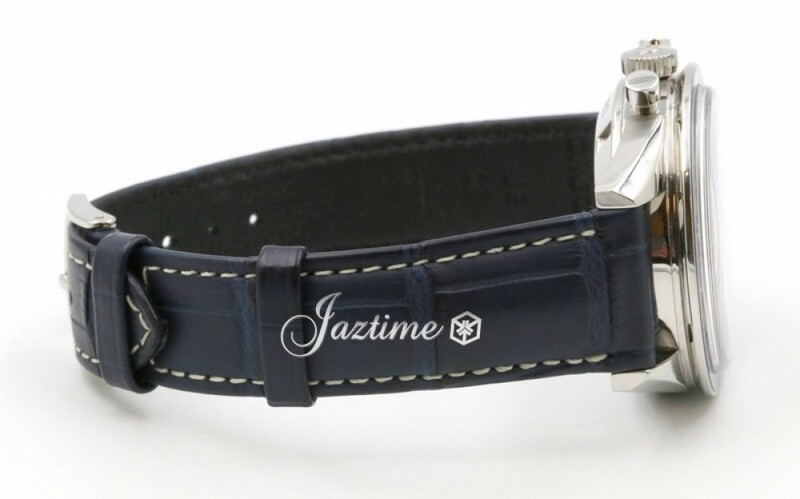 We would greatly appreciate it if you would buy a watch from Jaztime.com once in awhile. Alright, today we're going to be reviewing the limited edition OMEGA Speedmaster Moonwatch. 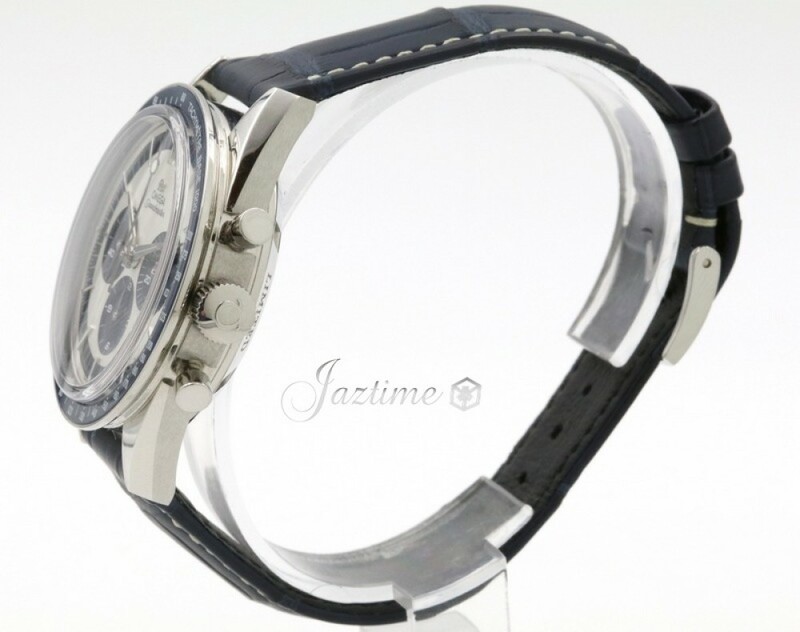 This is a chronograph watch with the also nickname of CK two nine nine eight. We'll go into a little bit of details about that later. The reference number for this specific model however, is three one one dot three three dot four zero dot three zero dot zero two dot zero zero one. And as I've mentioned the link to the watch will be in the description below. We've be going over the dial, bezel, case, crown, the pushers and also the strap and tang buckle. And of course we'll talk about the movement towards the end of the video. Alright so jumping right into the dial. So the color style dial besides the blue sub dials here, we have a nice beautiful white dial that's accented by those blue sub dials. Also bordered with that sort of blue bordering on the outer edge and also falls up with the blue from the blue ceramic bezel as well. As this is a chronograph watch the sub dials represents different configurations of elapse time. 60 seconds at the nano clock position, 30 minutes at the three o'clock position and 12 hours at the six o'clock position. For the we have nice silvery hands that accent against the white dial and the blue sub dials. There are also luminous tips as you can see from the sensor of both the hour and minute hand has sort of slim lining of white on it and that's the luminosity on the hands. There's also luminosity on the second hand indicated by the big circular indentation there and also on the backs of each hour marker. Each hour markers has these little tiny white squares behind it and those are luminous as well. So once it's night time, you'll be able to view the time perfectly in the dark as well due to the use of luminosity on all of the hour markers hands and second hands as well. Now specifically for this watch, as I did mention this is a limited edition watch. There's only 2,998 of these made as this is a throw back to a previous model that OMEGA had made previously called with the reference number CK two nine nine eight. And that was in production about in 1959 to about 1962. So about a three year run for that specific model watches. So that was a vintage style watch and they decided to bring that back, that old style watch and sort of modernize it this time with a few updates. 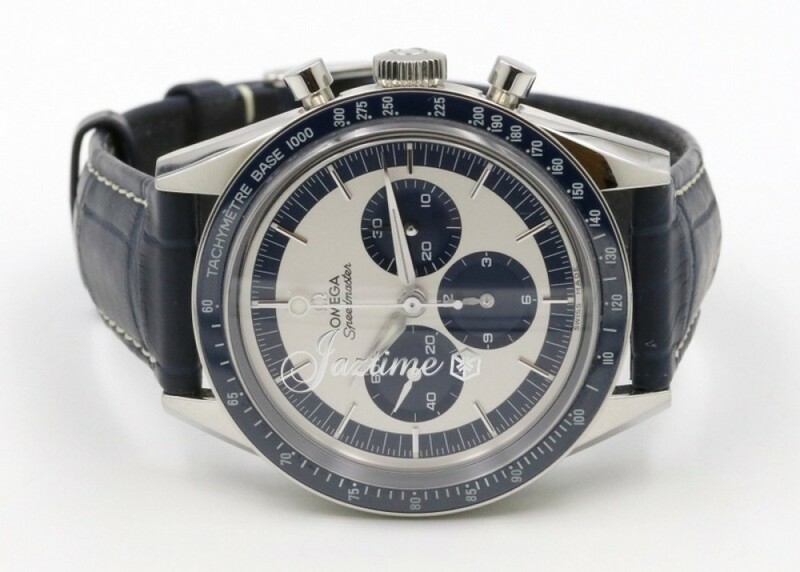 And then now we have this model of the watch which has as I mentioned the production of 2,998 only in the world as OMEGA typically likes to do their limited availability in reference to either the year or the mission number. So such things as like the previous one was like the Silver Snoopy which was the Apollo 13 mission. In 1970 they only made 1970 of those pieces so that's why there's only 2,990 of this one as is in reference to the mission, rather not the year for this specific watch. 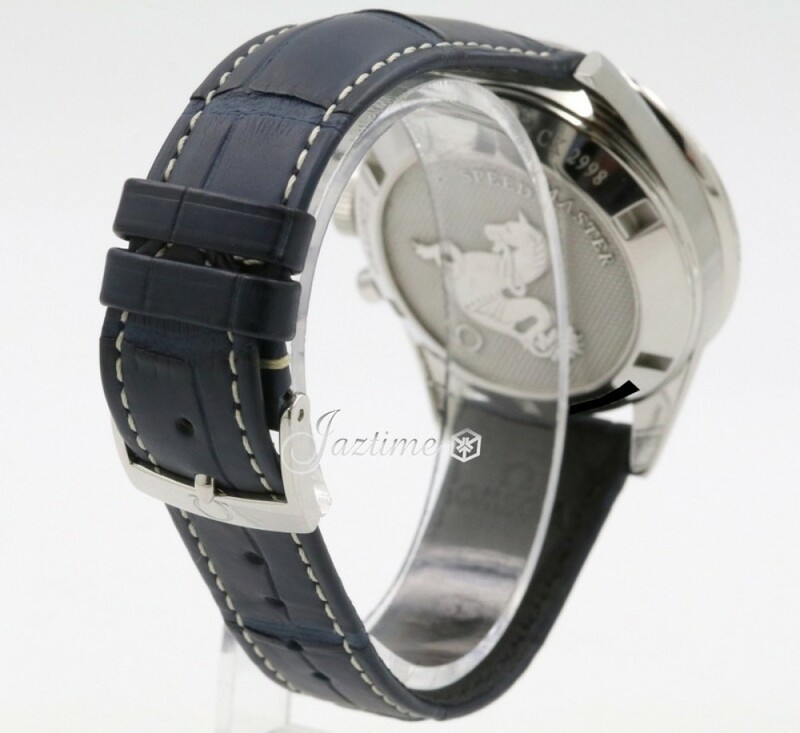 But very beautiful contrasting of that white dial with the silver accents and the blue overall. As we move onto the bezel. The bezel is as I mentioned a blue bezel as well. Has the tachymetric scale or tachometer scale all around the bezel and a very nice white can see goes throughout the whole bezel. There's also very thin with a nice high polish that sort of borders all around it to give a little nice shine along with that as well. As you move onto the case size the case size is a little peculiar. It is a 39 point seven millimeter case size. It's not a fully 40 millimeter case size, it is a 39 point seven and one thing I mention about the lugs, that's one of the sort of updates they kept from the previous models that they have. A very nice straight edge lugs. You can see very long straight lugs with nice high polish, high polish to the front and sides of the lugs as well and it borders very nicely with the high polish on the sides of the bezel as you can see. The profile of the case it is a thicker watch and will sit a little bit high on the wrist. Could fit under suit clothes, dress clothes but might have some trouble on tiger cuffs. And on the other side as well we see that nice brushed steel in conjunction to the crown and the two chrono pushers there. The chrono pushers and high polish and the OMEGA logo on the crown itself. As we move onto the crown now. The crown functions very simply just by unwinding or pulling the crown out and it only has the simplest, just that initial function of just being able to adjust the time however you like then pressing the crown back in. Always make sure the crown is pressed back into the watch as you want to keep the watch water resistant. At the two o'clock position is the chrono pushers as you can see starts that central second hand. Stops it with another push. And at the four o'clock, we'll reset that central seconds hand back to the original position and also the thirty minute and 12 hour elapse time trackers and the sub dials there will also reset to the 12 o'clock position. Alright moving onto the strap now. Strap is just a simple blue leather strap. 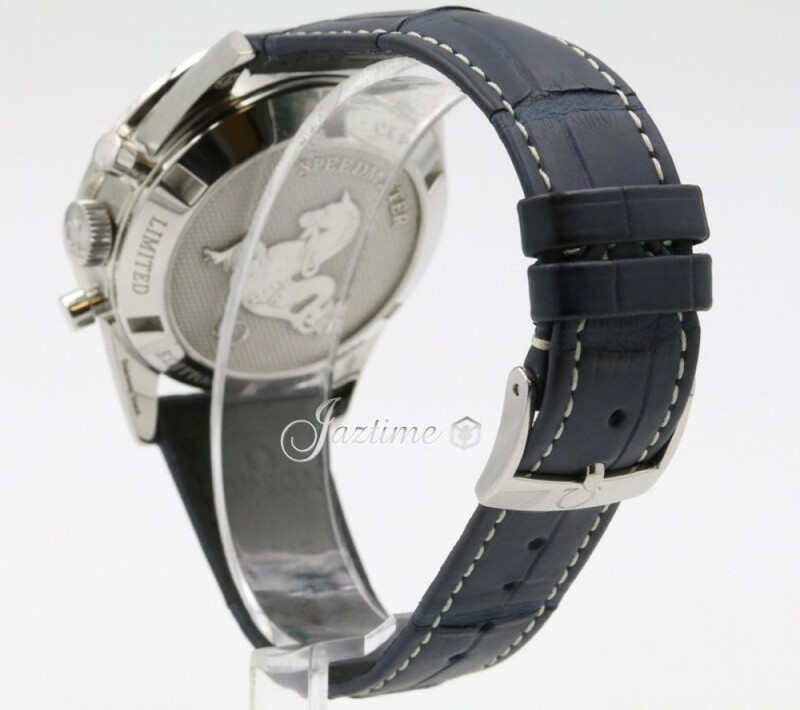 very simple, very beautiful blue leather strap. Nice accents from the sort of stitching to help border around it and contrasting really nicely against that blue. And then to the back of the strap you can see it's a nice black instead of that blue. 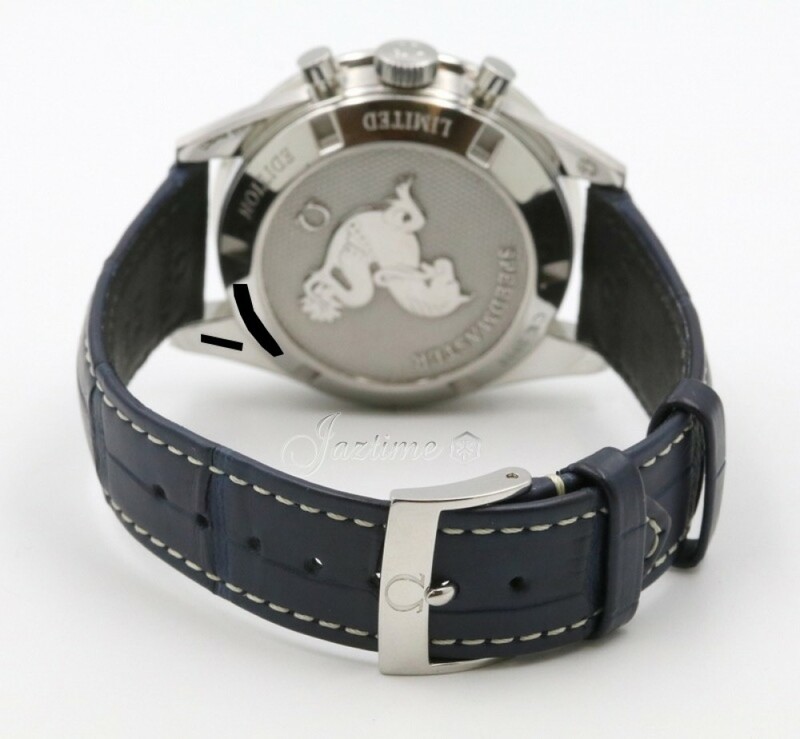 You see the OMEGA name stamped on there and the buckles simply just your average tang buckle with the OMEGA logo on the buckle itself there. As we move onto the movement, the movement is housed in this case backing. 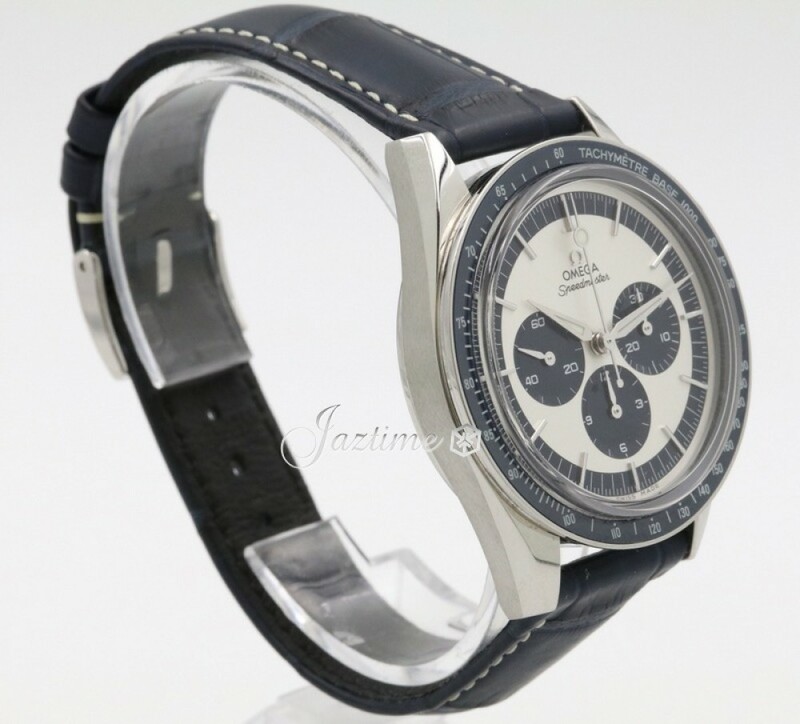 This is the OMEGA sea horse, nice and embossed on the back there with the Speedmaster. Speedmaster name embossed on there, OMEGA logo with that limited edition there also embossed. So very beautiful case back engravings there. 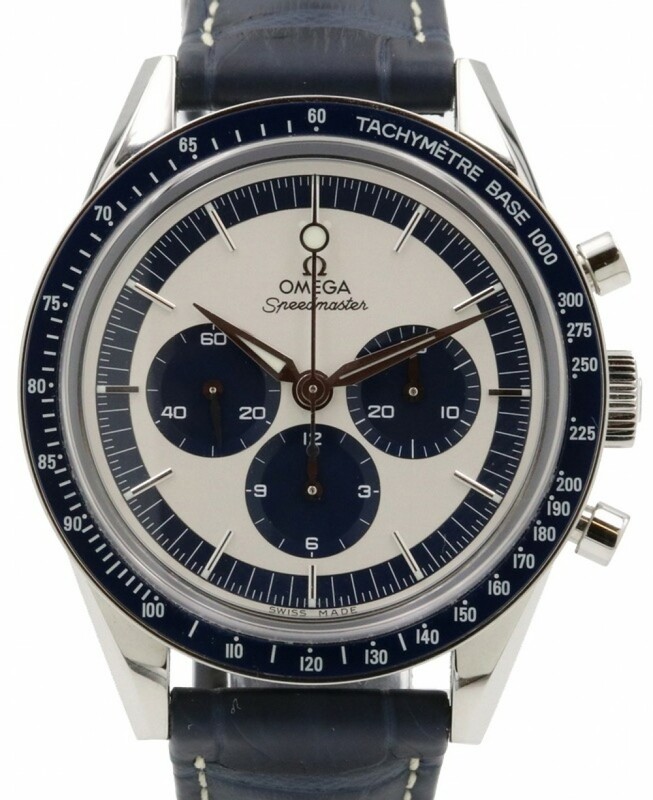 For the movement of this OMEGA watch this movement runs a movement that's ran in the Speedmaster professional pieces. This is the, apologize if I mispronounce this. Lemania Caliber 1861 movement and I guess that it is used in the Speedmaster professional pieces. It is a manual wind movement so you do have to wind and move and what you can do from the standard position here when the crown is pressed in you can just wind it by going clock wise and I will wind the watch. Okay. I'm actually going to show you this watch on my wrist now. So give me one second here. Alright and there is the watch on my wrist. So you can see not a very large watch but sits a little bit high off the wrist but looks absolutely gorgeous. Just really that just simple white dial being accented by so many parts of the watch being that nice shade of blue coloring with the high polish of the lugs and really the overall proportion of the watch, it looks absolutely fantastic. 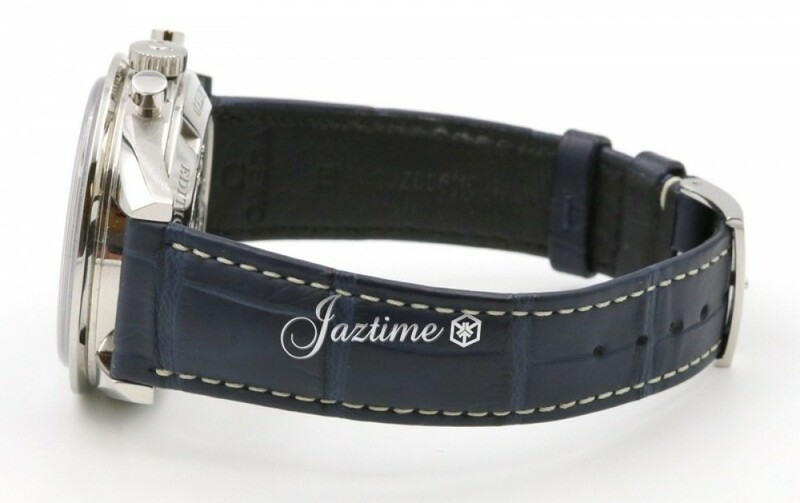 So if you're interested in this watch or any other watch for the lowest possible price check out our website at Jaztime.com We have the lowest prices guaranteed. We offer a one year warranty and if you like the video, please like, comment, subscribe below. Thanks for watching, hope to see you guys soon.